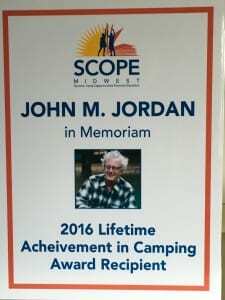 John Jordan, founder of Towering Pines Camp, recently received the Lifetime Achievement Award in Camping and was honored at a banquet sponsored by SCOPE Midwest (Summer Camp Opportunities Promote Education). 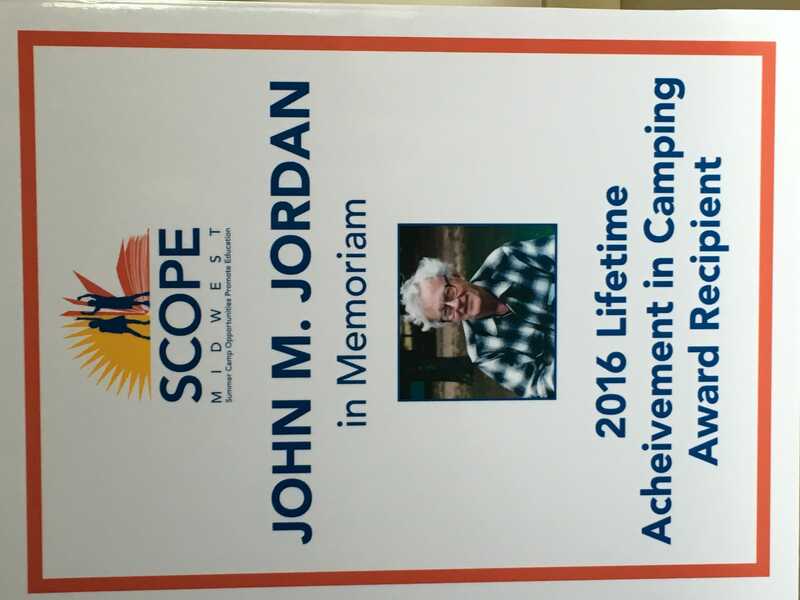 JoAnne Jordan Trimpe represented the Jordan family and read the following tribute to her father’s life at the ceremony. First, those people who receive lifetime achievement awards are the long distance runners of our species. They pass you in the streets, we see them at work, in our churches, and we meet them for coffee. 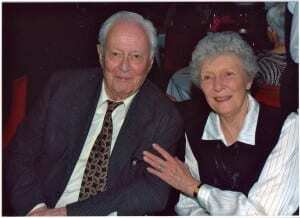 I would maintain that they often seem unremarkable … yet they accomplish very remarkable things. The attributes that set these people apart is a clarity of vision, a strength of commitment, and an almost unnatural capacity to keep their eye on the ball — without losing awareness of the changing world around them. At least that was my father. 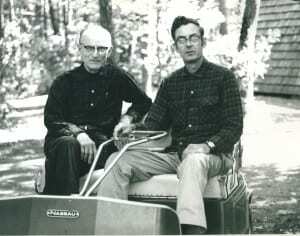 And yes, the world has changed dramatically since 1926 when my father was born, and 1945 when my grandparents sold their family home to purchase the property that became Towering Pines Camp for Boys. Dad was 19 years old. . . . . My son is 19 years old. . . . . Many of you hire first year college students as camp counselors who are 19 years old! Can we imagine any of them buying a fishing lodge in September and opening a summer camp with 80 campers, infrastructure, and the staff to support it 9 months later??? Fast forward 71 years . . . having added Camp Woodland for girls to the equation and after successfully operating Towering Pines Camp for 65 years himself, his children and grandchildren are working to carry forward his perspective of what is important in life, important to society, and to the cause he believed in, to a 5th generation of campers. 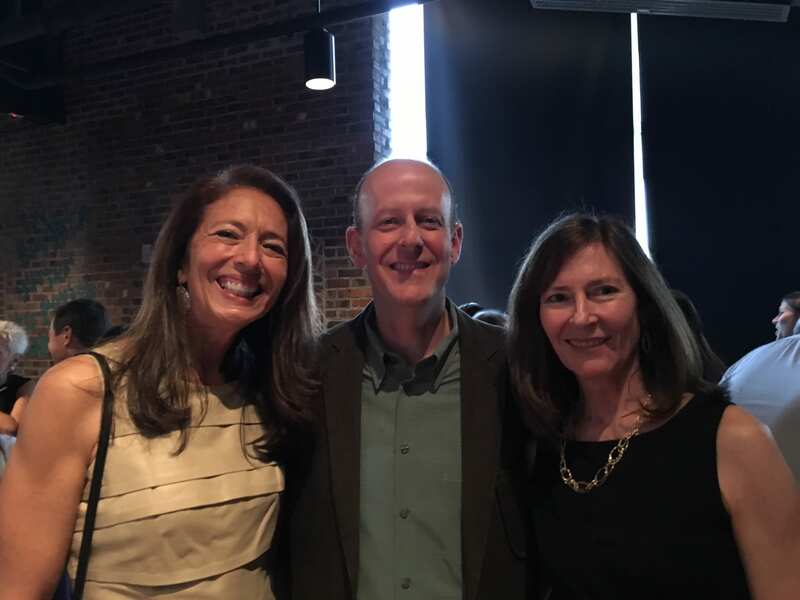 Will my brother Jeff … sister Susan … or I ever be judged by the compendium of our work and have someone go, “WOW!” – That’s a life of accomplishment? I would hope so but I think not; not like that of our father. 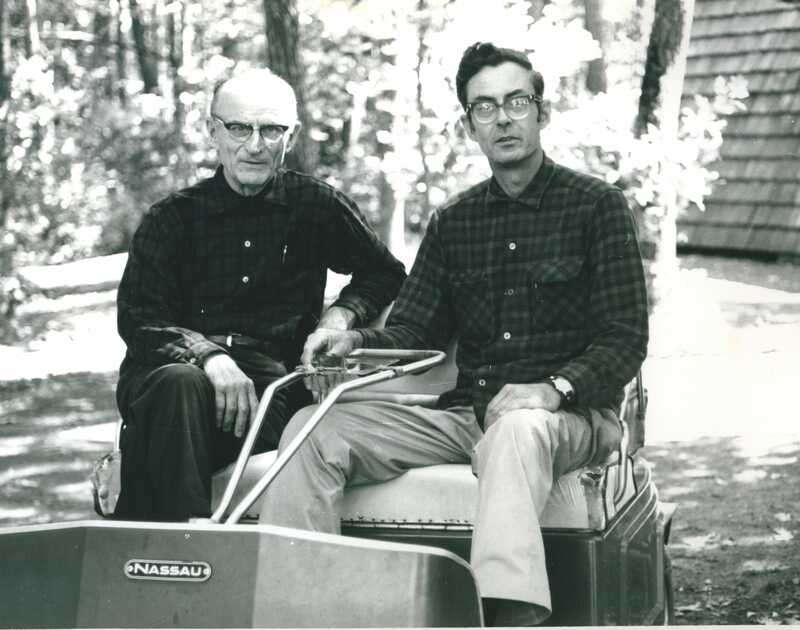 Against the backdrop of building a thriving summer camp my father discovered children’s education … or maybe education discovered my father. As a 5th grade teacher for 30 years he worked to bridge the gap between formal education and the experiential learning he focused on at camp. 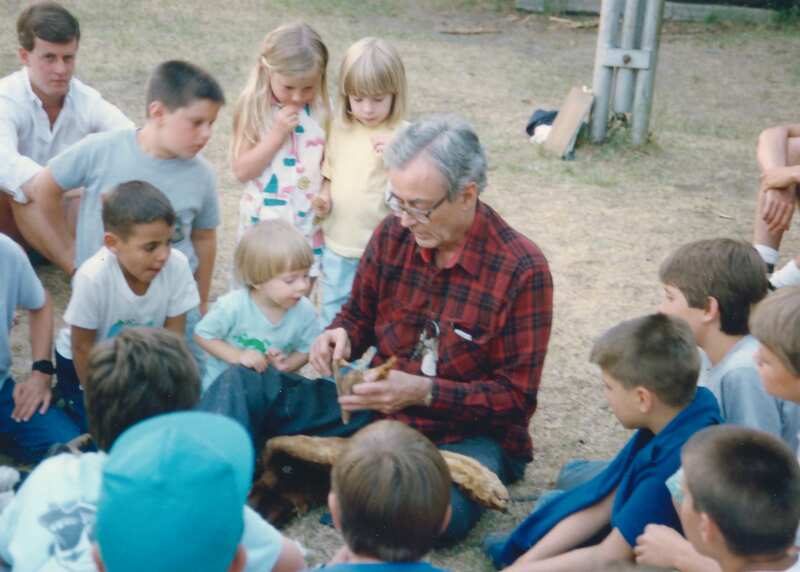 As a result, he used the investigative method in the classroom before it was given a name … conversely he offered academic tutoring at camp, then coming full circle, supported his camp staff in the development of the sensory approach to environmental education. This Towering Pines/Woodland program was featured in a National Geographic article in 1974 entitled “In Touch With Nature” and is used in camps today thanks to the book Acclimatization written by then TP program director Steve Van Matre. 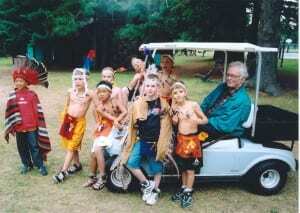 John Jordan teaching Indian Lore with grandson, Jack Trimpe. All of you associated with SCOPE clearly understand there is more to education than the classroom. My father believed there are no bad kids! 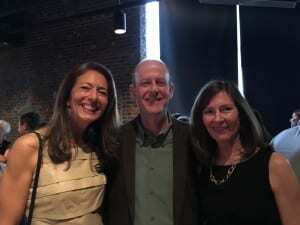 … which seamlessly aligns with SCOPE and its mission. 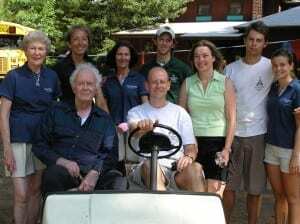 His practice of giving organic scholarships and working with families so they could afford to send their children to camp started in the 40’s and continued for his entire life. A lament that he regularly voiced was “I can’t help them if they aren’t here”. The camping experience, as my father envisioned it and fostered it, imprints lasting principles, ethics, and memories on (and in) every child who participates — an indelible stamp of what is good in them and what is right to carry into future life! There is so much more about my father that I admired … his innate understanding of children, his unbridled commentary on life, and his ability to do anything from building a cabin to building a program – all of it focused on growing the child. Many of you here knew that Dad actively worked to bring camp professionals together for the betterment of the camp community as one of the original founders of the Midwest Association of Independent camps. He mentored the current generation of camp leaders and was determined to learn from them as well. Thank you SCOPE for facilitating camps to do what they do best … foster the next generation of this world. We at camp may only touch a few but those we touch, touch others, and those others touch many more. We all know however, that if you’re not at camp you do not have the experience, you just have the story. SCOPE enables the experience and thus influences the future in the most positive of ways. I’m sure my father is looking down on this event with a wry smile, and a small chuckle. 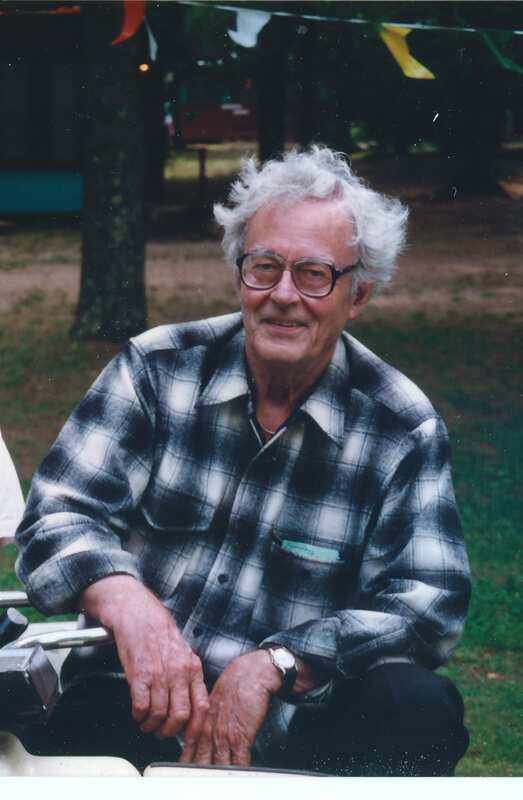 If he were here, he’d be HALF-present … and the other half would be conspiring on how to get more kids to camp. Thank you for this recognition, it means so much to our family and the campers & staff of Towering Pines & Woodland . . . . the long distance runners of this race that we call camp.